Directions: Sauté onion & garlic in olive oil over medium heat, stirring frequently, until translucent, about 3-4 minutes. Add eggplant & artichokes & cook for about 5-6 minutes, stirring often. Then add celery, bell pepper, & peperoncini. Cover & cook until firm but tender, about 5-6 more minutes. Add capers, olives, tomatoes, tomato paste, vinegar, lemon zest, parsley, oregano, thyme, & anchovies (optional) & bring to a boil, stirring constantly. Season with black pepper. Reduce heat to medium-low, until the mixture has a thick & chunky texture, about 8-10 minutes. Transfer the mixture to a container & cool. Cover with sealable lid & chill in the fridge for at least 30 minutes before serving. Serving Suggestions: Garnish with 10-12 handful fresh basil leaves (torn into small pieces), 3 Tbsp. lightly toasted pinenuts (or almonds or soy nuts for a healthier alternative), & Asiago shavings. (If you like your caponata with more heat, you could also add 1/8 tsp. crushed red chili pepper flakes.) Serve with lemon wedges & toasted ciabatta. You can either serve the caponata on a single slice of ciabatta (open-faced), or make a sandwich with two slices of ciabatta. If you'd rather skip the bread products, you can also serve the caponata on slices of tomatoes or grilled zucchini. 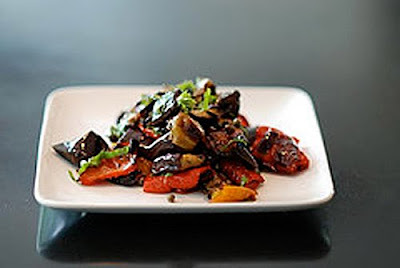 Caponata also makes an excellent topping for pasta or pizza. Alternate Preparation Ideas: The other way you can make this dish is by cooking only the onions, celery, & eggplant, & then combining them with the rest of the ingredients in their raw form. Also, if (1 large) eggplant is unavailable, 2 mediums-sized zucchini will make a nice substitute. To make this recipe vegetarian or vegan, simply omit the anchovies soaked in milk.